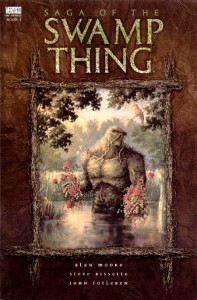 Shouldn’t this just be called “Saga of the Swamp Thing”? one is the series title and the other is the volume title. It’s a little wonky here, and I’ll double check when I get to this book for adding tags, but I think this is how it’s titled. Hmm… this also seems to be called “Saga of the Swamp Thing: Book 1”, with Book 2 covering issues 28-34 and Book 3 covering 35-42. But “Saga of the Swamp Thing: Book 1” includes issue #20 whereas this listing does not. Yeah, that’s the more recently released hardcover, which, as you mentioned contains issue 20.